Decorated with a Chinese-inspired metallic floral pattern on White background. Two-button flush offers a choice of 1.6 or 0.8 gallons per flush (gpf). Join the Wash Don't Wipe Revolution with the Swash SE600 advanced bidet toilet seat. The Swash SE600 is packed with features at an affordable price. Made with the highest quality components and backed by Brondell's industry-leading customer service, the Swash SE600 bidet toilet seat easily installs on your existing toilet. The Swash SE600 bidet seat has all the features you need to create a personalized experience. Turn your toilet into a toilet of tomorrow today! Experience a new level of cleansing for daily comfort and confidence. This advanced C3 toilet seat with cleansing functionality uses naturally soothing water as a refreshing, hygienic alternative to toilet tissue. A remote control lets you instantly adjust the water spray for position, temperature, and oscillating or pulsating motion-and you can store preferred settings for two users. Other amenities include a heated seat, adjustable warm-air flow for drying, and built-in odor control. 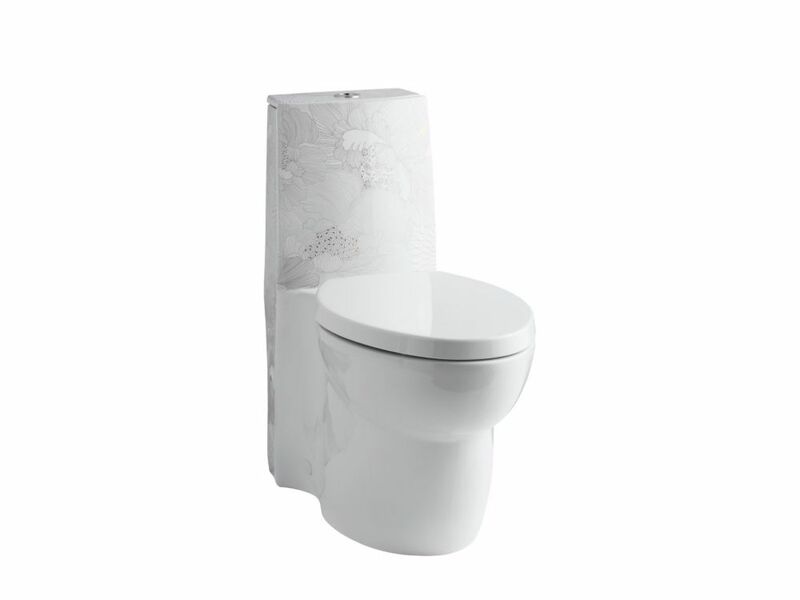 Empress Bouquet Design On Saile One-Piece Elongated Dual-Flush Skirted Toilet In White The Empress Bouquet design offers a modern interpretation of 18th-century Chinese print work. The exquisite floral motif with gold and metallic detailing wraps across this Saile one-piece toilet, which features a striking contemporary silhouette and quietly closing seat. This high-efficiency toilet offers you the option of 1.6 or .8-gallon flushes, saving you as much as 22,200 gallons of water per year compared to an old 3.5-gallon toilet.